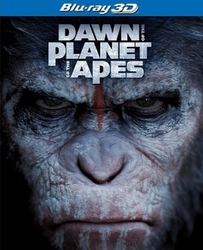 Andy Serkis, Jason Clarke, Gary Oldman and Keri Russell star in this thrilling next chapter of The Planet of the Apes. It is 2026, and humanity has been pushed to near extinction by a deadly virus. When a group of survivors desperate to find a new source of power travel into the woods near San Francisco, they discover a highly evolved community of intelligent apes led by Caesar (Andy Serkis). The two species form a fragile peace but dissention grows and the groups find themselves hurtling toward all-out war.